Exploration Remote Sensing Webinar: What Every Geologist Needs to Know About Technology and Trends for 2017 - From DigitalGlobe, Wed Feb 22. TES: The virtual geography field trip versus learning outside the classroom? - A year 7 geography instructor in the UK offers candid thoughts about the value of Google Expeditions as a substitute for field trips. Bottom line: It was cool, but students didn't seem to learn much from experiences with a VR version of the seven wonders of the world. Edutopia: 53 Ways to Check for Understanding- Interesting list via @dianamaps. Huffington Post: Rethinking Design Thinking - University of Minnesota's Thomas Fisher shares five mistakes organizations make in applying design thinking. The Conversation: Why UPS drivers don’t turn left and you probably shouldn’t either - Not news to those who study geo, but perhaps news to those who do not. The Guardian: Online mapping tool gives FGM runaways a path to help - Another use for crowdsourced maps. Science: Interactive map: March for Science roundup - A Google map. U. S. News: Map: Law Schools That Graduated Supreme Court Justices - Another Google map. Penn State has joined FutureLearn, a UK-based MOOC provider, and will offer courses on that platform. Maps and the Geospatial Revolution will be offered in May. Other U.S. schools participating in the launch on this side of the pond include Purdue, Colorado State University, the University of Virginia Darden School of Business and American University. The University of Mary Washington has introduced a new accelerated five-year master’s program for Geographic Information Sciences studies. It builds on the 2014 launch of a Master’s of Science in Geospatial Analysis. Supported by the Department for Education, the Royal Geographical Society is offering 80 Geography Teacher Training Scholarships for eligible geographers starting their teacher training in September 2017. The chair of Education and Outreach for Georgia URISA announced an online mapping competition for college and university students in Georgia. There are prizes, but they are not identified. Due date: May 10. An annual prize has been established by Jack Dangermond for the best GIS PhD dissertation at University College London. It's named after Roger Tomlinson but it's not clear what the winner receives. There's also a Tomlinson GIS prize at the University of Redlands. The GIS&T Enrollment Survey aims to develop a "national assessment of the current scope and major trends in the teaching of GIS&T." Instructors are asked to fill out the survey for each GIS course they teach. 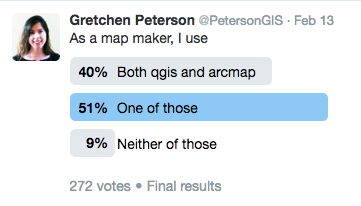 The survey is endorsed by UCGIS, Esri and AAG and focuses on the U.S. but international courses can be added too. And, per David Cowan who is leading the effort, MOOC instructors are invited to add their courses. Yes, that warms my heart! The Universities of Michigan and Minnesota are collecting information on the integration of ArcGIS Online with campus Learning Management Systems (LMS). This survey is short (five minutes) and will help the team better understand current working processes and needs for integration. Penn State is joining the Open Textbook Network to help support faculty use of and student availability to free, openly licensed academic course content. There's a new-to-me online service, with a month free trial tier aimed at remote sensing users. SpaceAnalyzer, a company based in Estonia, offers its platform, called Spaceye. Descartes Labs shared three new satellite imagery-based global composite images constructed using data from the Landsat 8, Sentinel-2A, and Sentinel-1 satellites. You can look at them, but best I can tell you need to become a partner to work with them. The USGS’ The National Map Corps (TNMCorps) recently launched an updated mapping application. The new editor features an improved user interface, search capabilities, and background transparencies. Most importantly, the new platform increases the speed in which the data becomes available to the public through The National Map and US Topo maps. Hopeworks 'N Camdenis in the news at Philly.com. Paulette Marie Hasier has been appointed chief of the Geography and Map Division at the Library of Congress. She's the first woman in the role and has a fine liberal arts and library science background. Go libraries! That Gettysburg electric map I've been covering for 17 years (!) is in the news again. It's off limits as the building that houses it gets updated. This is the map story that will never die! Two elementary school boys drew an elaborate map for police of a mid-January incident. They saw the heist on their way home from school in the small town of Oer-Erkenschwick, in Germany’s northwest. The map helped police crack the case. Geography matters! GEO Business working with Class of Your Own (COYO) developed a full day event for students aged 14-19 to illustrate the excitement of and potential future in the geospatial industry. The Geo Careers event will be co-located with Geo Business in London on May 24. A school has already been selected to attend. I see that the American Geographical Society is getting behind the card game GeoPlunge. NY Times: Hans Rosling, Swedish Doctor and Pop-Star Statistician, Dies at 68 - Sounds like I should haverrun into Rosling in my career, but I hadn't. Theres also, a nice tribute from NPR's Math Guy, Keith Devlin. Steve Coast: The Disappearing Operating System - It's true! Operating systems matter less and less. Riverside Cemetery now has a complete GIS and Google Earth Mapping inventory of its tree and shrub populations thanks to Eddie Bevilacqua, Professor and Undergraduate Coordinator at the State University of New York (SUNY) of Environmental Science and Forestry. Two masters students did the work. Geographer David Papotti will deliver a special lecture on the geography of Italian pasta at 5:30 p.m., Monday, March 6, in 004 Kirkbride Hall on the University of Delaware campus in Newark. It's part of the department's 50th anniversary celebration. Food geography always draws a crowd! Last month 60 secondary school students from across Tanzania gathered at Marian University College, Bagamoyo for a STEM Youth Boot Camp. A number of them learned about GIS and web mapping using OpenStreetMap and QGIS.